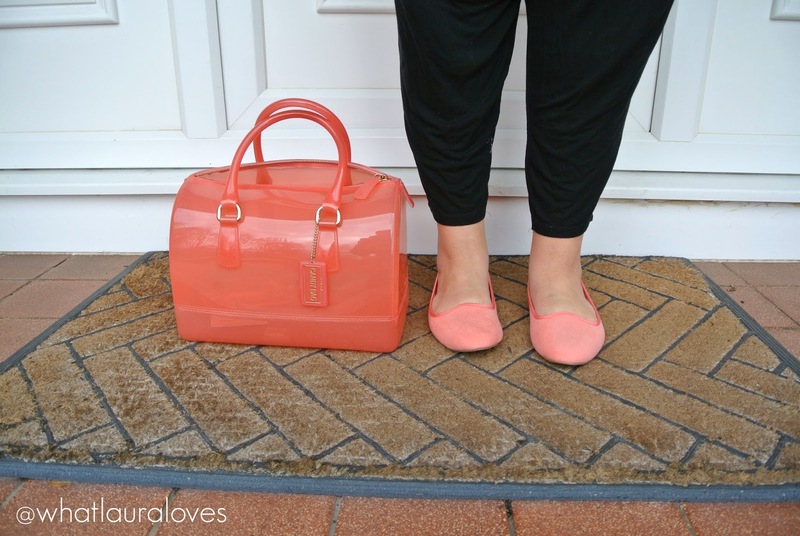 In today’s post, I’m going to show you how I add a bright pop of colour to a working wardrobe. When you’re working in an office job it is easy to get stuck in the ‘all black, grey and white’ monochrome rut, particularly during the winter but when the spring comes, it really is time to brighten up that dark look. My chosen pop of colour is coral. I absolutely love shades of coral for both the spring and summer. It is my favourite colour. 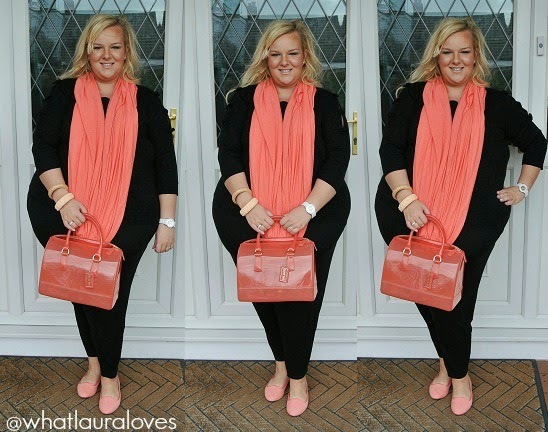 I’ve kept my outfit all black and selected some of my favourite coral accessories to brighten up my outfit. 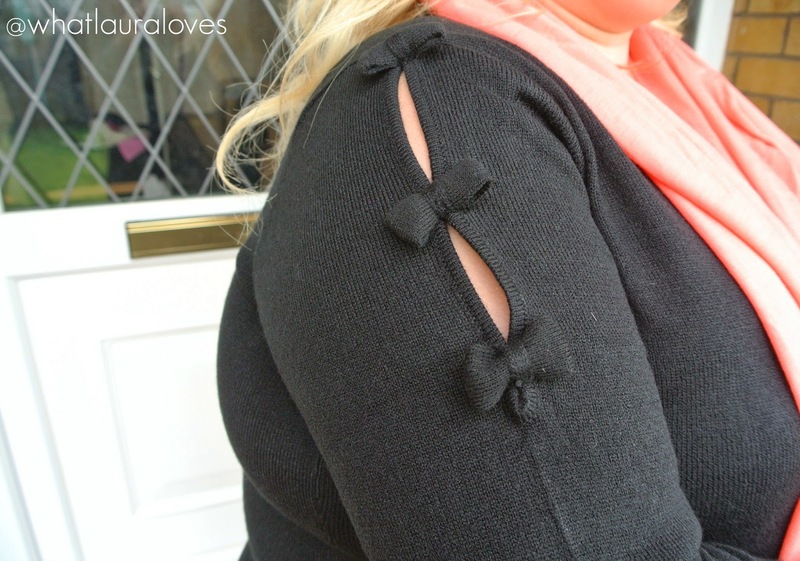 The jumper that I’m wearing is the Bow Sleeve Jumper from Fashion World. I have it in black but it is also available in a vibrant violet shade. This is a gorgeous, relatively light weight jumper that can take you from autumn through to spring. It is super soft and features cut out details down the sleeves with bows, making it look super cute and feminine. It can be worn throughout the week with work trousers or at the weekend with jeans. It feels a little short on the body so I’d suggest sizing up if you have a longer body but other than that it is a great fit. I’ve been saying for years that I’m sure I have little legs and a long body and it was only until I was measured on a photoshoot that I discovered that I’m two inches longer in my body than my legs. Gosh, I love being right! What is your work dress code like? I used to love picking out outfits for work but we now wear a uniform. It's not the nicest but it forces me to wear flat shoes now so at least I have comfy feet all day! Coral really suits you. I love to wear black basics then add a bit of colour. Love the scarf you're wearing.